Los Angeles Lakers star LeBron James will have a pair of his Equality sneakers on display at the National Museum of African-American History and Culture this fall. The iconic Equality sneakers that LeBron James wore in a game against the Washington Wizards are headed for display at a Smithsonian museum. During a game in the nation's capital last December, the then-Cavaliers star sported the mismatched shoes. One was black and one was white. Both had a golden Nike swoosh and "EQUALITY" emblazoned across the heel. It was the first time James, now playing for the Lakers, had worn one black and one white version of the shoes in a game, News4 reported. James said he wore them in a rebuke to President Donald Trump. "Obviously, we know where we are right now," James began. "And we know who's at the helm here." "This is a beautiful country and we're never going to let one person dictate how beautiful and how powerful we are," James said. A year after their appearance in Capital One Arena, the sneakers are set to return to D.C.'s National Museum of African-American History and Culture for display in the museum's sports gallery this fall. It's another step in James' history of using the shoes in support of the museum. This isn't the first time the sneakers have been linked to the museum. 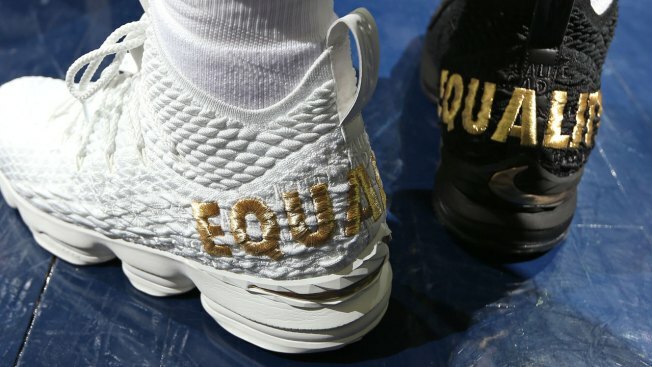 More than $457,700 was raised after the museum partnered with James and Nike to raffle off 400 pairs of Equality sneakers. All the money went to the NMAAHC. Dozens of youth from Equality's community partners in Baltimore, Chicago, Los Angeles and other cities were treated to an early viewing of the sneakers, the museum said. LeBron James, who recently left the Cleveland Cavaliers to play for the Los Angeles Lakers, continued to give back to his hometown of Akron, Ohio, with a brand new school. The I Promise School opened Monday with 240 third and fourth grade children.